A close friend had invited me, my sister and my cousin to a dinner before he left for Christmas holiday break. He let us choose the place. We'd been talking about taking him to this restaurant which my sister and her friends frequented. It didn't take us much convincing when we told him about the place. It was only my second time at The Bay restaurant on Ladprao 15. The food there I have tasted so far were all good and the prices were reasonable, too. On the day we went, I had a meeting with my boss. We finished late. Getting to the restaurant on time would be impossible given the traffic in Bangkok so I rang my sister to tell her to wait for me because I was still coming. I took all means to make it to the dinner although I knew they'd probably be finished by the time I got there. I was right. When I arrived I found their plates empty and saw what they had ordered for me. 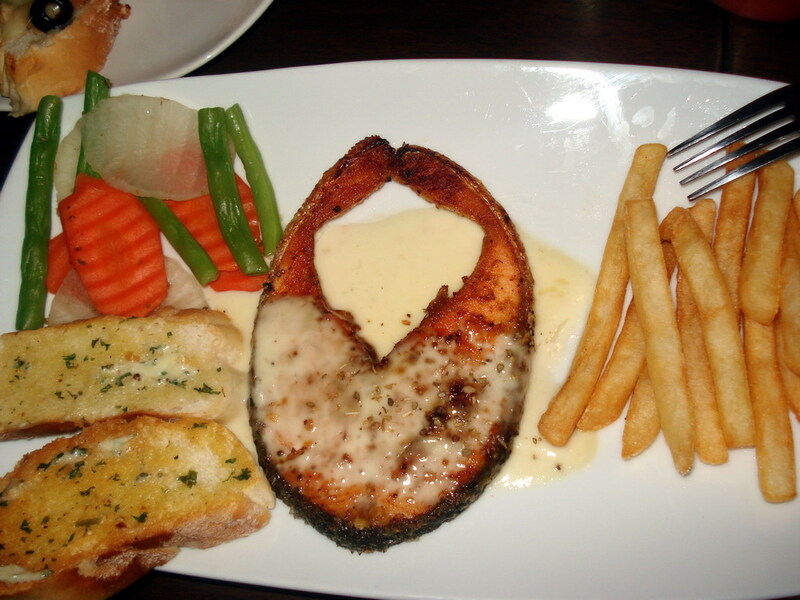 Salmon steak. It had been sitting on the table for an hour. It was cold. I was too tired and hungry, I didn't say a thing. but sat down, ate the steak and a couple pieces of bruschetta they'd left for me.